Cutting one of the most recognisable figures in interior design, the DAW Chair is a real interior design icon, and STIN.com's child-sized version opens up that effortless sense of style to the kids. Built to two-thirds the size of the original, it is set at the perfect height for your child to sit and relax or doze off with their favourite book. And with a range of exciting colours to choose from, it makes the perfect addition to any kid's room or playroom. The Charles Eames DAW Chair is one of a series of chairs designed by Charles Eames in 1948 for the Museum of Modern Art's Low-Cost Furniture Design competition. The original has the honour of being the first ever mass-produced plastic chair, and the name, DAW, is a reference to its attributes – Dining Chair with Armrests and Wooden legs. 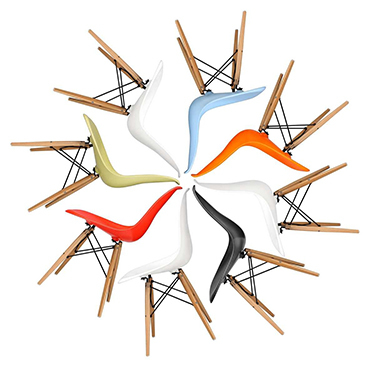 The Charles Eames DAW Chair's combination of comfort, durability and style has made it a popular choice for almost everywhere, from dining rooms to playrooms, offices to libraries. It's bright colours and easy stackability also made it the ideal chair to be scaled down for kids.